First Prepaid Mastercard Programme Launched in Latvia by Prepaid Financial Services Limited (PFS) with Programme Set to be Expanded to Additional Territories in Q4 2015. Prepaid Financial Services, a leading provider of global prepaid solutions and a Mastercard prepaid partner, is delighted to announce the launch of the WestStein Prepaid Mastercard, in association with WestStein SIA, an innovative financial company based in Latvia with an international reach. The WestStein Prepaid Mastercard is a chip & PIN prepaid card available online (in Euro) to customers in Latvia and will soon be available in additional currencies and territories across Europe. The card is available to consumers as well as corporate clients looking to offer a prepaid value proposition to their customer base, employees and members. Consumers can apply for a prepaid card with an annual loading limit of 2,500 Euros online with the option to upgrade to a fully personalised card with a balance of 15,000 Euros, by providing additional identification. Corporate cards come with higher loading, spending and withdrawal limits as default and transaction fees on corporate cards can be customised to suit each client’s specific needs. As the card is a Mastercardbranded prepaid card, the WestStein consumer and corporate prepaid products can be used to make purchases in-store, online and over the phone at 34 million retailer locations worldwide as well as to make cash withdrawals at over 2.1 million ATMs that display the MastercardAcceptance Mark. Noel Moran, CEO of Prepaid Financial Services, stated: “We are delighted to partner with WestStein to launch PFS’s first prepaid product in Latvia. We have been observing the Latvian market carefully and this is a strategic time to launch a highly flexible non-banking product that appeals to both consumers and corporates. We expect the WestStein Prepaid Mastercard to quickly become a strong product in the marketplace. The WestStein Prepaid Card is available via a quick and simple application process and is ideal for safe and secure online shopping with privacy, instant moneyshare with friends and family, travelling without the worry of overspending as well as budgeting and making bill payments. The card is also ideal for families who have children travelling abroad as students on international internships and exchange programs, as the card minimises the risk of losing cash and enables users to pay in foreign countries with ease. Furthermore, parents can easily transfer additional funds to their children, securely and instantly through the online platform. 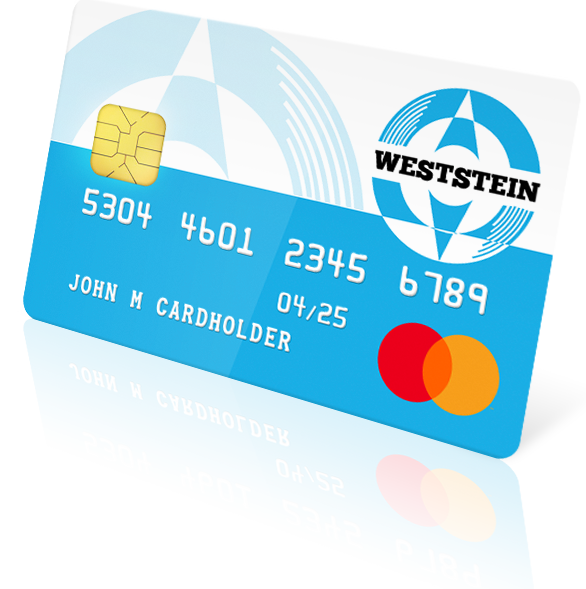 With no credit checks or minimum income requirements, the WestStein prepaid card provides an excellent alternative to traditional current accounts for those without a bank account or poor credit history for managing their wages and allowances as well as Corporates looking to pay wages to temporary workers. WestStein Corporate prepaid cards are also ideal for bonus disbursements as well as the management of company expenses, corporate travel, reward and loyalty programmes. The WestStein Prepaid Card launch is the latest addition to the international portfolio of programmes launched by Prepaid Financial Services, which now has active and live programmes in 20 countries outside the UK. The WestStein Prepaid Mastercard is issued by Prepaid Financial Services Limited pursuant to a license from Mastercard International Incorporated. Prepaid Financial Services Limited is regulated and authorised by the Financial Conduct Authority, registration number 900036. Registered Office: 36 Carnaby Street London, W1F 7DR.